Last weekend, April 16-17, I volunteered at the Buffalo Road aid station for the Yakima Skyline Rim 50k, and then raced the 25k the next day. In a word, the entire weekend was amazing. My experience volunteering Saturday absolutely fed in to my energy for the race on Sunday, but I'll get in to that in another post. The race started at 9:00 am, which felt fairly late for a race. The plus side was that it allowed me the luxury of waking up at a decent time and stop for coffee before making my way through the Yakima Canyon to the start/finish line at the Umtanum Recreation Area. Having spent time there the day before as a volunteer helped calm my nerves-- I mostly knew what to expect. After saying some hellos --and chatting for a bit with Gunhild Swanson!-- it was go time. 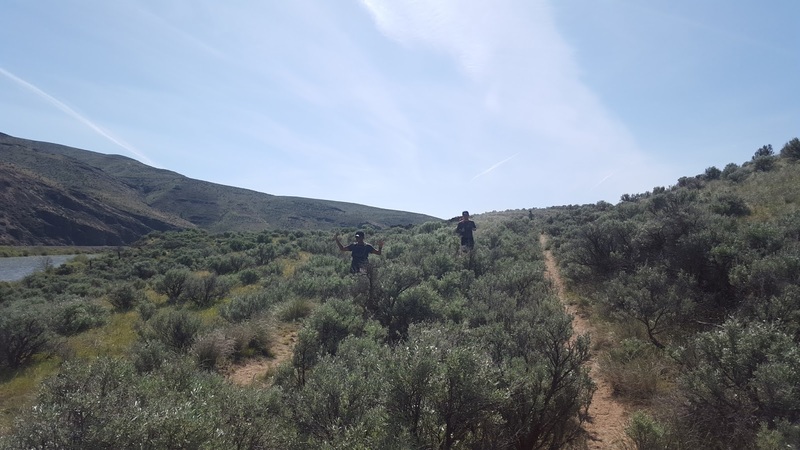 Race director James Varner warned us of rattlesnakes (and probably other stuff, but that's all I heard) and sent us on our way. I started in the way back with my friend Belia. We followed the crowd through the gravel parking lot and then waited to cross the swaying Umtanum Bridge over the Yakima River in single file line. Then came a quick duck underneath the railroad tracks before the climbing began. 4,500 feet of elevation gain in 15-ish miles. No joke. We fell in to single file line, climbing. And climbing. And while the trail wound around a bit, it wasn't switchbacks-- it was mostly just straight up. Straight, no switchbacks. Hi Belia! The fragrance of the sagebrush along the trail was intoxicating. I repeatedly ran my hands along the leaves to cover my fingers with their scent. In the long conga line I was maintaining a perfect, comfortable pace, which was a good place to be that early in the race. I overheard someone behind me explaining uphill technique to another runner and made a mental note of the advice. When we finally hit the top of the ridge the trail opened up in to a jeep road and the line of runners quickly spread out. It felt very good to finally begin running! It was a gorgeous day-- expected to be quite warm, up to 80*, but the breeze was fairly strong, so I never felt too hot. On top of the ridge we had views of Mt. Rainier and Mt. Adams-- and even Mt. Hood way off in the distance. 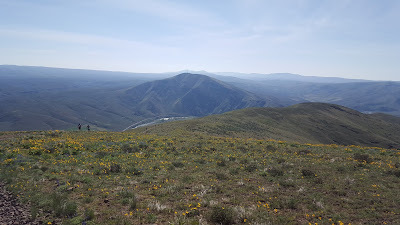 The Yakima River was way down below us. Heading out on the ridge. Somewhere on the jeep road I realized that I was in absolute heaven, and was having one of the most enjoyable race experiences of my life. My body felt strong and like I was made for that course. As the trail began winding back down the ridge I felt like a little kid jumping down the trail. Since the course was an out and back, the front runners were coming back up the trail, so we did a little jockeying moving past each other. Eventually the trail went what felt like straight down and there were a few moments were I had to stop and figure out how exactly to place my feet to continue moving down it. Finally at the bottom, there was an aid station right next to the river. It was awesome to see the previous day's 50k female winner, Kaytlyn Gerbin, cutting up watermelon for the runners! I grabbed some watermelon and oreos, topped off my water bladder and headed back out. Saying hi to Belia as I left the aid station. My biggest annoyance on race day was how completely uninterested in food and drink my stomach was. Every time I ingested anything my stomach began making audible "glurping" sounds with every step. It sounded, and felt, very unsettling. Ultimately it meant I didn't eat or drink nearly enough during the race. It was a gamble that ended up paying off, as I fortunately had high energy the whole day. The climb back up the ridge was tricky. Every time there was a bit of a break in the elevation I thought "that was it!" and, well, that wasn't it. At the top of each climb was another climb! I power hiked as strongly as I could and began passing many people on that section. With every person I passed I said a quiet prayer I wouldn't see that person again on the downhill. While I can power hike all day long, downhills are my kryptonite. I felt amazing and just. didn't. stop. Climb, climb, climb, run when I could, then climb some more. Sometimes my hands dropped to my knees to help power my legs up. 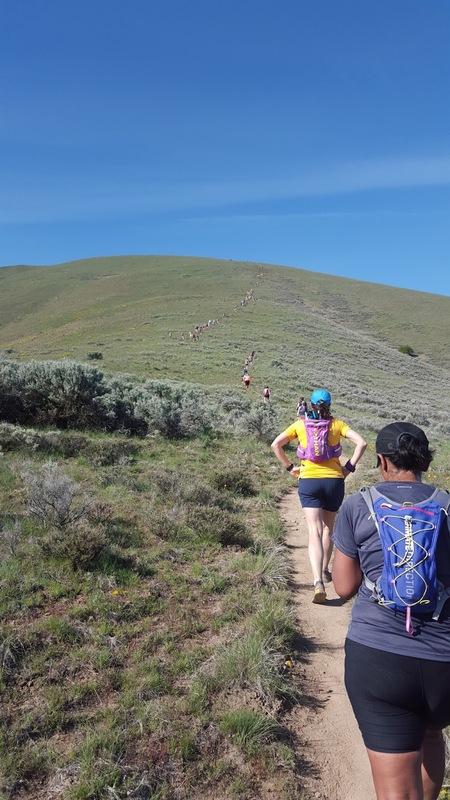 There were a few moments where my mind went to Gunhild Swanson, and I thought about her ascending this last section of her 50k. I hoped to channel even a fraction of her strength! I ran the jeep road section as hard as I could and suddenly it occurred to me: I might finish under four hours. Four hours was my absolute "A" goal, something I thought sounded good, but was likely unattainable. Once the trail turned back downhill I knew there was about two miles left. I stopped to text my husband that I was going to beat four hours, took a photo, tucked my phone back in my pack and set my head around bombing down the trail. Despite being a downhill weakling, I was extremely proud of myself on this section. 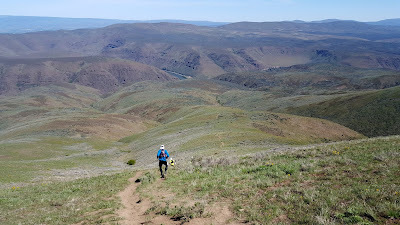 I pushed as hard as I possibly could and my mind wandered towards advice I had recently read from Kilian Jornet: "Go down as if you are dancing." My only mishap occurred as I came around a tight corner, and ran right in to a sagebrush plant that took a chunk of flesh out of my knee. I quickly assessed the damage, uttered a few swear words, and continued on as the blood ran down my leg. It certainly wouldn't stop me! At the bottom it was time for a sharp turn to duck under the railroad tracks before dashing across the wobbly Umtanum bridge. Then the only thing separating me from the finish line was the loop around the parking lot. 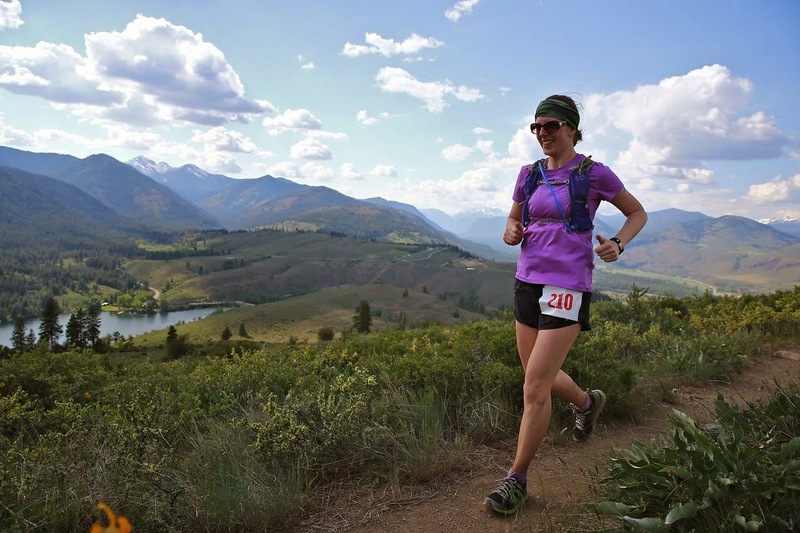 I repeatedly glanced at my watch knowing the only way I could get under four hours was to sprint across the gravel. Unfortunately my legs were suddenly done, and I walked briefly a couple of times before rounding the corner to the finishing chute. High-fived James Varner at 4:00:41. While I didn't get a sub-4:00, finishing in four hours was a massive accomplishment for me. There was no coming in second to last that day! In fact, I was in the top half of all female finishers. My husband, daughters and mother-in-law were at the finish line to cheer me in. It felt amazing to have them all there. 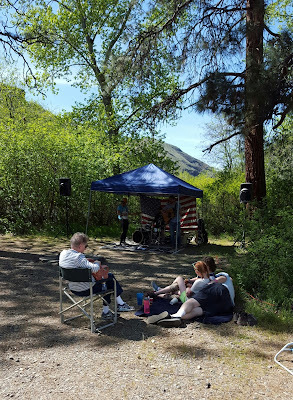 We spent the next two hours eating, relaxing, visiting, soaking in the Yakima River (okay, that part was only me) and listening to the music. My family relaxing in front of the Pine Hearts. It was the perfect end to an ideal race. Cannot wait for next year, I will absolutely be back for at least the 25k. Not sure if I will be strong enough for the 50k (the cut-off is nine hours) but maybe! Post-race, there is a bit of carnage: my feet have more blisters than I had ever seen and my knee is scabbed over. 48 hours later and my quads can barely lower me to a sit, let alone do any running. All good reminders of a hard-fought race, though, so definitely worth it. Way to crush it!! Fantastic job, girl! Next stop, Sun Mountain, right?